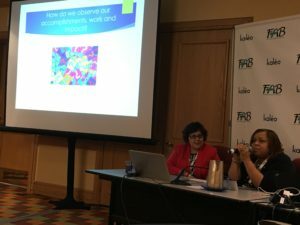 My first FablogCon post was about the Expo and the general ins and outs of the conference. The TealFamily and I are still making our way through samples and placing orders for new products that won us over! I think daily of things I wish I would have thought to say to people or questions I should have asked. This time I want to talk about all the information that was shared at this event. The Expo and friends were so worth this trip and the indepth information that was shared are helping to make me a better parent, blogger, advocate and self-caregiver. The conference had two tracks, the medical and the blogger. As you all know, blogging is new to me so I was really excited to learn from some of those who are been “in the biz” for a while. Honestly, the worst part of the conference was trying to make choices on which talks I went to. I think we all feel like we need to clone ourselves most days and this weekend was no different! 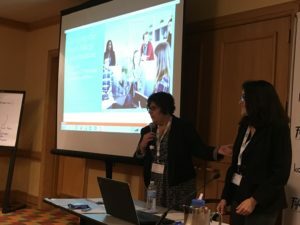 The highlight from the blogger talks for me was the one led by Celiac and the Beast blogger, Erica Dermer, Gluten Free Frenzy’s, Chandice Probst, and Cindy Gordon of Vegetarian Mamma. These women know all about the ins and outs of blogging, PR, and so many other things I know NOTHING about. I know now that Comic Sans is a BIG no no, that we all have a voice, and that there is enough room out here for all of us. Rivka Kawano and Ritesh Patel blew me away with the amount of social media information they know. 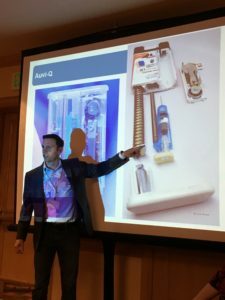 I think I walked away with more questions about what I am doing and how can I do it more effectively, but they certainty gave me a more tools than I had. On the medical side of things, there were so many great talks given. Nicole and Robert Smith of AllergicChild are the parents of a now young adult with allergies. They spoke about raising teens/tweens with allergies and their presentation was amazing. I loved hearing from both Mom and Dad and it was comforting to hear that what happens in our home is similar to what happens in other allergy homes. Kid asks to do something, Dad says, “Woohoo, let’s go!” and Mom’s not as eager about the idea. Sounds a lot like the Teal House. Mrs. Smith talked through the things she would ask both kiddo and Dad to come up with a plan so that kiddo CAN do anything, even if it means becoming the Scout Master to make it happen! Their best advice was to lead with your amazing child, NOT their allergies. That is so important for all of us to remember. The session I learned the most from medically speaking was by Dr. Julie Brown, Associate Professor of Pediatrics at the University of Washington School of Medicine and co-Director of research for the Division of Emergency Medicine. If the name sounds familiar, that is because her research was instrumental in getting the epinephrine administration guidelines changed recently. These improvements will hopefully decrease injuries associated with the old recommendations for administration. Dr. Brown went into very detailed information on everything from needle length to how they penetrate into ballistics gel to simulate human flesh. 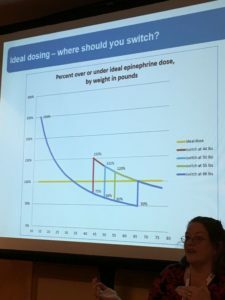 She detailed the dosing and temperature ranges on the medication itself as well as the pharmacokinetic end of it; this was all awesome for the science nerd in me. She had slides and videos and x-rays of what the major players’ injectors look like inside. All of this was simply amazing information and really helped me understand more about the medication that we rely on daily as insurance against a reaction. is one of her videos on how the needle part of the devices works. You can see one is left open, one is covered after the injection, and one actually retracts into the device once the injection is complete. Aleasa Word from Compassion for Anaphylaxis and Caroline Moassessi spoke next to Emotional and Social Literacy in Living with Food Allergies. This was a big bowl of chicken soup for the food allergy community soul. Both women spoke to the personal experiences that have helped shape them into the advocates they are. We spoke of issues many of us have been forced to deal with, such as the lack of understanding and empathy from our family and friends and how we react to these struggles. My takeaway is that we can only control how we react to others. In the words of Ms. Word: “You do you, boo!” We have the right and the responsibility to take care of ourselves and do what we have to for our families and us! The weekend ended with Love Thyself. Most of us here in allergy land are really great at being careGIVERS. We give at home to make things safe for our families. We give at school to be sure our kids are included. We give through extracurricular event, Scouts, and PTA. We are on all the time and if we do not take care of ourselves as caregivers, we will burn out and will not have anything left to give. Most of us don’t ask for help when we need it. We don’t phone a friend and we all need to really examine that in ourselves. 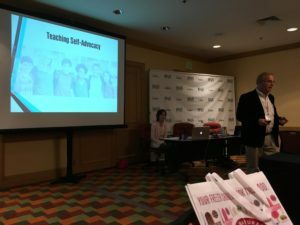 We are all so busy advocating and teaching our kids to advocate that we lose site of our own needs. Robyn O’Brien, Cybele Pascal, and Kelly Rudnicki all spoke about taking care of ourselves so that we can keep doing this work both in and out of our own homes. It was a great reminder for all of us as we go out out into a world that may not always understand us or our motivations, but which we need to engage to keep doing this work. I know I keep talking about “my people” and being surrounded by the greats in this community. I cannot speak highly enough of Jenny Sprague and her team who put this conference together. The care and love, the understanding and knowing looks of “I’ve been there,” – it was a space where we could grow, learn, and make new friends while reconnecting with the old. I met so many people I have “known” online and now consider friends I miss already. It is now 48 weeks till the next FablogCon. Not that I’m counting or anything.